Thirteen express rail trains going each way will run between Hong Kong and 14 long-distance destinations each day during peak periods, transport secretary Frank Chan Fan says. The announcement came after the SAR government signed a memorandum with China Railway Corp yesterday on the key operational issues for the Hong Kong section of the express rail. In terms of long-haul destinations, Chan said there will be four major routes for 14 "direct" destinations. The first covers Shantou in Guangdong and Xiamen in Fujian. The second services Nanchang, Shanghai and Hangzhou, while the third will head north to Changsha, Wuhan and Beijing. The fourth will travel west to Guilin and Guiyang in Guangxi. Chan did not announce the fare prices for the long-distance trips, but said they will be a combination of the price of the trip from West Kowloon to Futian, and the price for the rest of the journey on mainland soil. The memorandum said Hong Kong and mainland authorities will be permitted to set their fare prices and divide the earnings proportional to the travel distance. 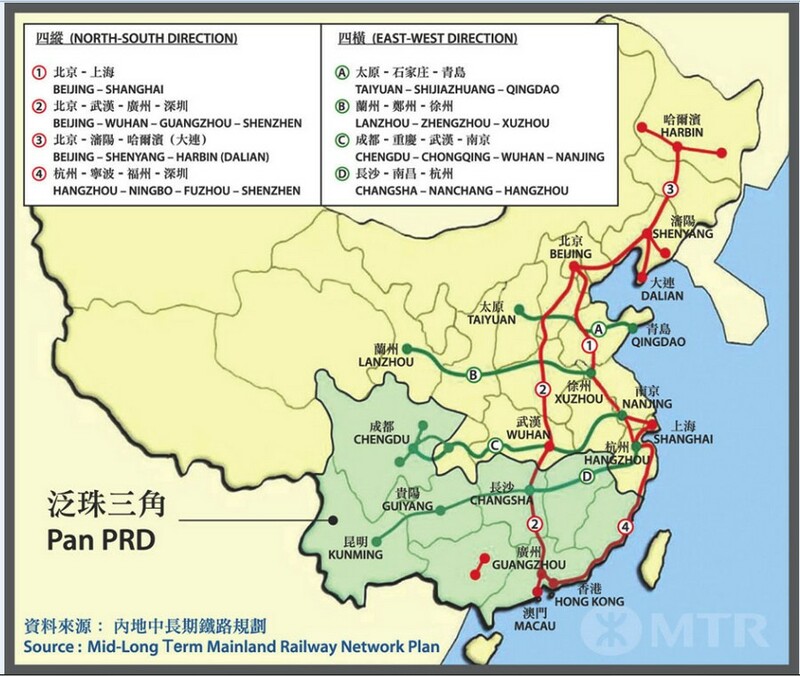 But Chan said no final decision was made on splitting revenue with China Railway Corp. Fare prices for short-distance trips to Futian and Guangzhou North were announced earlier and will cost HK$80 and HK$260. Civic Party lawmaker and the leader of the pro-democracy camp's co-location concern group, Tanya Chan Suk-chong, said the government had scaled down many of its promises. Instead of having 33 long-haul trains going both ways each day, it has been cut to 13, she said. Other cuts included the number of long-haul destinations, which Chan said has been decreased from 16 to 14. Pro-Beijing lawmaker Michael Tien Puk-sun of Roundtable said the SAR government should demand at least HK$66 of the HK$80 train fare to Futian. As for the HK$260 to Guangzhou South, he said the government should ask for HK$100. The Hong Kong General Chamber of Commerce welcomed the signing of the memorandum. "Once operational, the services will bring significant time and cost savings for businesses in Hong Kong," said chairman Stephen Ng Tin-hoi. "At the same time, it opens up new options for Hong Kong people to spend an affordable weekend in fascinating cities like Kunming and Guilin. So it really opens new opportunities for business and pleasure once operational in the third quarter of this year."